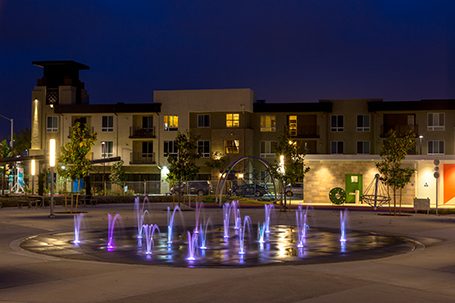 Millenia is the first urban-mixed use center in Southern San Diego County. 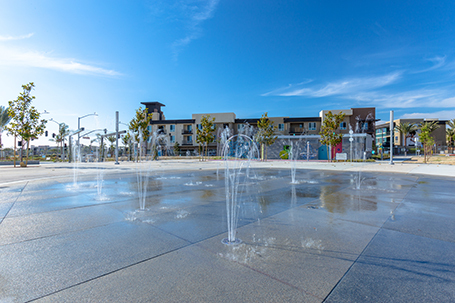 Sprawling over 210 acres of land in the heart of the Otay Ranch Master Plan area in Chula Vista, California, the multi-billion dollar development includes urban parks, recreational facilities, open space, plazas, and a trail system. Stylus Park is one of six themed neighborhood parks planned for the Millenia development. The theme of “Interaction” can be seen in the park through the entwined gathering spaces, walkways, and program elements, which work together to create a series of unique spaces to encourage socialization. 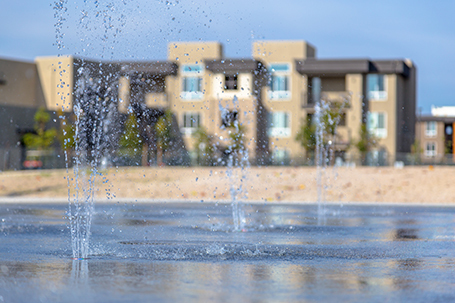 The interactive water feature is located in the park’s central plaza, and is surrounded by a children’s play area, a large turf space, a series of shade structures, informal gathering spaces, and a comfort station. 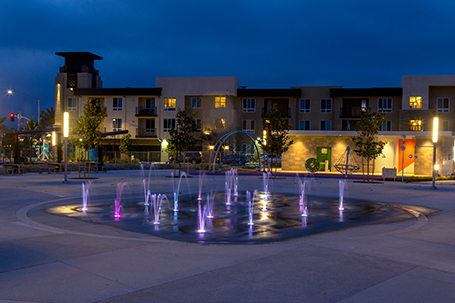 The interactive splash pad features 16 fountain canisters, each containing color changing LED lights that can be programmed for choreography through a show controller. 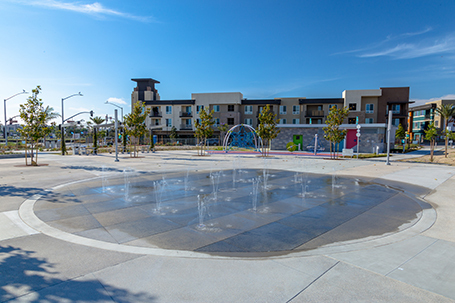 The circular splash pad was poured in sections, with different colored concrete mixtures, creating an architectural pattern which comes to life when covered with water. 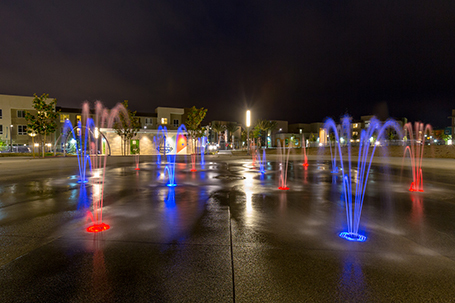 The fountain jets are initiated by a single foot activator located on the splash pad. The water feature system utilizes a 4,000-gallon underground, prefabricated, balance tank. The programmed water features are completely automated and the recirculation system includes state-of-the art water treatment and filtration.